Cancer isn’t funny. Everyone is affected by the disease in some way, so we have to live with it and that’s a fact. So, when cancer is depicted in film, as it has been for decades, it doesn’t necessarily have to be a somber and realistic drama, like last year’s excellent “James White“, but there’s a thin line, since heavy melodrama only adds to the suffering. It can include humor, like in “50/50” or the recent “Me and Earl and the Dying Girl” for example, but too much funny can border on distasteful and off-putting. Somewhere in the middle sits the dramedy “Other People”, which premiered earlier this year at Sundance and is now about to receive a limited release. The film follows 29-year-old David (Jesse Plemmons, “The Master“), a New York City improv player with the Upright Citizens Brigade and aspiring television writer, who moves back to Sacramento, California to live with his family in order to help care for his ailing mother, Joanne (Molly Shannon, “Me and Earl and the Dying Girl”, ironically). She is in the advanced stages of a rare form of cancer called leiomyosarcoma, which is generally not very responsive to chemotherapy and radiation. After coming out a year ago, David returns to his home town insecure and dejected. His TV pilot for Comedy Central didn’t go anywhere and he recently broke up with his boyfriend, Paul (Zach Woods, “Ghostbusters“) of five years, the latter of which he keeps to himself to prevent the expected sympathy and unsolicited advice from his family. 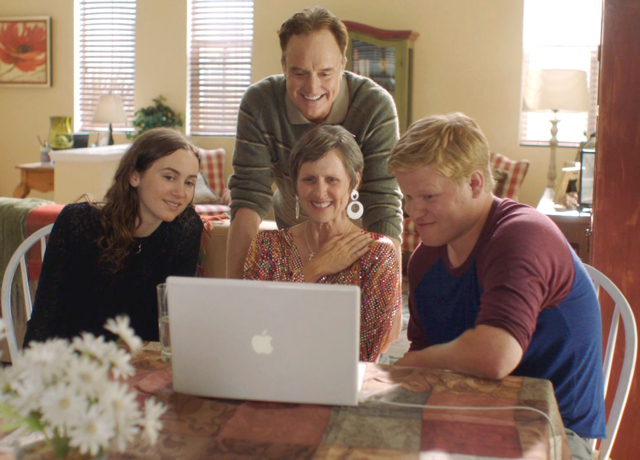 As the film opens, we see David lying in bed with his mother, surrounded by his father Norman (Bradley Whitford) and his younger sisters Alexandra (Maude Apatow) and Rebecca (Madison Beaty). She has just died and the family is embracing her and each other. Sounds of sobbing and sniffling can be heard and then the beep of an answering machine can be heard. As a message for Joanne is being left, the camera remains on the family (who remain in the bedroom with the lights out) as we hear the voice of Joanne’s friend leaving a message, stating she wasn’t aware that she was sick and then we listen to her order “a bean-and-cheese burrito with a coke” at a drive-thru and then continue with her message. This is the kind of humor that’s in “Other People” and, to be honest, it’s just not that funny. What we’re given is obvious attempts at humor, impeccably timed to be “funny”, which is unfortunate since there are also genuinely honest heart-wrenching dramatic moments in the film, primarily between Plemmons and Shannon, who have great chemistry together. They just happen to be in a movie that’s populated by thinly realized characters that either feel disingenuous or fit an overly familiar mold, such as the grandstanding tween played by J. J. Totah, who brazenly embraces his homosexuality and David’s doting grandparents from Minnesota, played by Paul Dooley and June Squib, who live out of their RV. Everyone just seems either too cutesy or predictable. It’s a shame, since “Other People” is something of a catharsis project for writer/director Chris Kelly (a writer for “Saturday Night Live” and “Broad City”), who has based the film predominately on his own experiences. Although many can unfortunately relate to his story, it’s easy to pinpoint the clichés of this subgenre throughout most of the film. After that opening scene, Kelly turns back the clock to the previous New Year’s Eve, as we see a crowded house of family and friends in the family’s Sacramento home and then progresses month after months as we track Joanne’s terminal deterioration. Varying degrees of grief and fear are covered in “Other People”, mostly from the perspective of Plemmons’s David as he navigates through his own frustrations, loneliness and insecurities about where he’s at in life. Kelly knows the protagonist well and isn’t afraid to show him as a bit of a selfish narcissist. Despite that being quite prevalent in the world we live in, it’s an element that comes across as slightly pretentious for a film that could easily rely on heartfelt emotions and the understandable uncertainty and confusion that comes from being near a dying loved one. Plemmons’s best scenes are his one-on-one scenes with other characters – such as a frank conversation he has about coming out and dating that he has with Gabe (John Early) his one gay friend in Sacramento (it just so happens his mother died of cancer too) and the inevitable confrontation he has with his passive-aggressive father (Whitford does some great listening in a key scene which requires him to do just that) about never being accepting for who he is. These very raw and real scenes are intermingled by Kelly with other scenes that feel forced, like when David has a panic-attack on a blind date and then later on at a grocery store as he tries to buy laxatives. Plemmons nails these scenes, but Kelly directs them in such a way that feels very overbearing. The saving grace of “Other People” is Shannon, who shows such vulnerability and boldness as the strong-willed Joanne, a character who seems determined to go out on her terms, despite her crippling fears. Shannon has the capacity for comedic moments, but her strength can be seen in the expressions she wears as Joanne comes to terms with what comes next as she decides to quit chemo and says goodbye to her career as a grade school teaching, knowing that her bad days will soon become worse. There’s a great sequence where the whole family takes a trip to New York City to see David perform with the Upright Citizens Brigade. It feels like the calm before Joanne’s debilitating downward spiral, where everyone is having a good time, laughing and cherishing the moment. The improv troupe purposely pull David’s mother out of the audience as a volunteer and Shannon shines during this moment where Joanne completely entertains the audience as she answers questions about her life that will immediately be used as material for the group’s improv work. We see David proudly watch from behind and understand his mother is likely the one who always supporting him in his passions. It’s one of the few unassuming heartfelt moments in the film, where Kelly trusts the actors and situations to play out naturally. 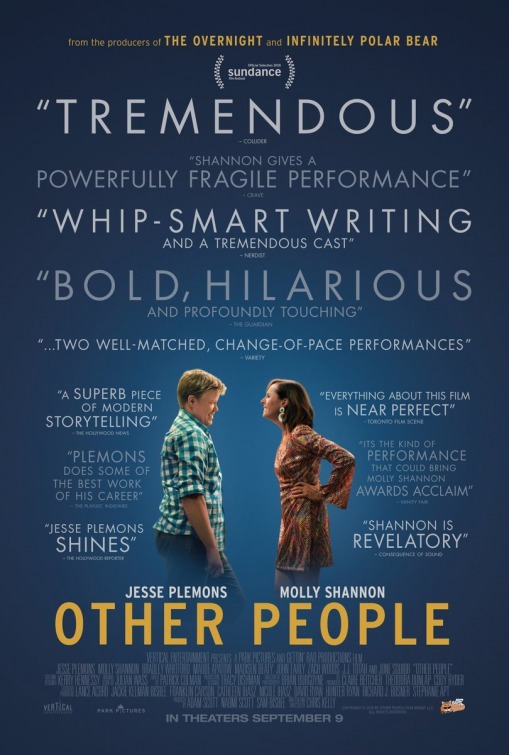 Unfortunately, the questionable choices in “Other People” seem to derail the film. Like the confounding re-use of the song “Drops of Jupiter” by Train – which is incorporated at least three times throughout the film (and that’s three times too many!) and I never caught on to the annoying song’s relevance as it relates to any of the characters in the movie. Near the end of the film, Kelly even thrusts the song upon us as a sort of elegiac send-off for Joanne. No, thank you. That song, along with certain characterizations and situations seem to pivot the film into a jarring pretentious obviousness that is untrue to the material’s potential. I really wanted to like this movie more than I did. It’s definitely hard to make a movie that predominately revolves around a loved one dying from cancer that doesn’t feel emotionally manipulative or somehow formulaic, especially when it’s inspired by someone’s own experiences, but that’s what happens here. Although it’s obviously a personal project for Kelly and there are some tender moments, ultimately “Other People” suffers from some very familiar beats that are indicative to films that frequently work the festival circuit.